WELCOME TO OUR ADVISORY PRACTICE. Montecito Capital Management Group has been advising clients with personalized wealth management services since 2004 and the firm's founder, Kipley J. Lytel, CFA, has been an investment leader and contributing author on financial topics for over two decades. We are a Registered Investment Advisory ("RIA") firm offering conflict-free counsel to individuals and families during the accumulation of asset phase, or in retirement. We often tell prospective clients that there can be plenty to worry about, but the fact that they have decided to consult with a professional advisor on any financial matter, then that in effect is taking an instrumental risk management step. This is why we offer prospective clients an initial complimentary advisory consultation where we would look to convey insightful guidance on both financial and investment considerations. Many of our clients have worked hard their entire lives and have sought out our stewardship to develop strategies for their financial future. We focus in on what really matters to clients, and for us that has been to spend a good deal of time identifying what is the best planning approach for their unique goals, followed by actionable advice. Our relationship objective is to meet the client’s investment and financial goals by providing direction, eliminating dangers, focusing on opportunities and implementing effective strategies. We are also actively engaged in creating better outcomes for clients through effective portfolio management, including portfolio construction, thoughtful investment selection, rebalancing, cost containment and tax efficient investing. We are honored by the many accolades received, including ﻿﻿Forbes Magazine ﻿﻿the Top 10 Most Dependable Wealth Managers in Southern California and a coveted "﻿Five Star" advisory ranking by ﻿Paladin Registry﻿, reserved for the nation's elite ranked advisors﻿﻿﻿﻿ based on an extensive advisor screening evaluation of credentials, ethics, business practices and quality of services. Montecito Capital Management was also recognized again in 2018 by Expertise as one of the Top 20 Financial Advisors out of 898 advisory peer firms after a rigorous examination of 25 variables across five categories: Reputation, Credibility, Experience, Availability and Professionalism. Moreover, as recent as June of 2018 the Wealth & Money Management Award was bestowed upon Montecito Capital Management for Best Wealth Management Practice in Southern California. We are often asked by prospective clients "What sets you apart from other advisors out there, how are you unique?" and we therefore have put together a summary showing "﻿﻿﻿﻿﻿Our Difference﻿﻿﻿﻿﻿" (click link). It is our philosophy to work with most anyone who is sincere in the prospects of improving their assets, retirement lifestyle and estate given they value advice and guidance from an advisor. We strive to distinguish the value proposition of our advisory services as it relates to enhancing a client's financial standing by combining actionable planning advice with objective investment guidance, while also providing clarification on the cost-benefit of our ongoing counsel. It is our goal to deliver transparency on fees, costs, actions and rationale for recommendations to our clients. Our wealth management practice is also geared toward inclusiveness by encompassing a wide scope of asset sizes from the mass affluent ($250,000 -$1 million) to the high net worth individual ( > $1 million). Moreover, our clients benefit from a fee structure that is considered "pure" fee-only, which means the firm's sole compensation is derived from a fixed-rate on assets in which we actively advise. Indeed, this fee-only approach often aids clients with a sliding fee scale of 1.0%-0.6% where the incremental declining rates are tied to corresponding higher asset bracket sizes. 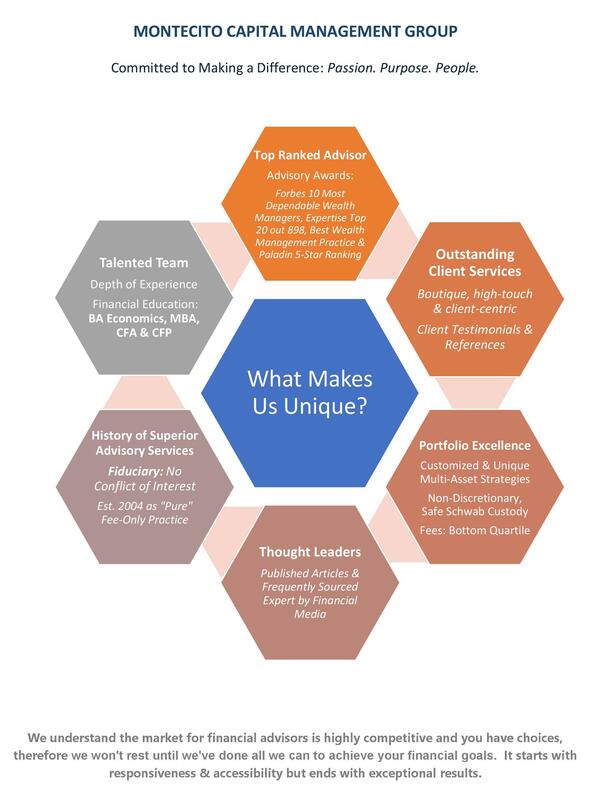 In return, our client advisory services are all-encompassing from portfolio management, financial planning, retirement solutions, philanthropy and unique asset "type" considerations, such as real estate and businesses. The term "pure" translates into a more holistic, independent and fiduciary-driven advisory practice where we are not in the business of 'selling' investments products, nor do we have outside incentive conflicts given we do not accept commissions. As a team, we offer portfolio, financial and retirement planning specialty counsel with a range of expertise designations, such as Master of Business Administration (MBA), Chartered Financial Analyst (CFA) designation, Certified Financial Planner (CFP) designation, along with other licenses to guide clients through the financial decision-making process. Kipley Lytel has over 25 years of investment finance experience, with expertise in client portfolio management, financial advisory, retirement strategies and diverse investments, including equities, fixed-income, alternative assets, stock valuation & ratings, bond credit analysis and real estate matters. His prior institutional work experience with private funds and investment houses (Pegasus Group, Pacific Strategic Fund Group, ML Stern et al.) involved portfolio management roles covering bonds, stocks and other diverse asset classes. He received his Master of Business Administration (MBA) as an honored Fellowship Recipient from the Peter F. Drucker School of Management at Claremont Graduate University. Lytel also received his undergraduate Bachelor of Arts (BA) degree in Economics from The Claremont Colleges. He holds the Chartered Financial Analyst® designation, is an active volunteer member of CFA Institute and has been a Regional Expert for CFA Institute's Advisory Panel on investment management. Lytel has served as a Board of Director for a number of entities, both private and publicly traded. He has been cited and/or published in Wall Street Journal, Business Week, Barons, Forbes, Bloomberg Wealth Magazine, Financial Planning Magazine, Seeking Alpha, Investment News Magazine, Advisor Perspectives, among others. Lytel enjoys spending time with his wife & two young children while also pursuing a range of outdoor personal activities, such as mountain hiking, fly fishing, kiteboarding and tennis. He is active in many charitable organizations and supports Santa Barbara Rescue Mission, Direct Relief Humanitarian, Hillel, Women's Economic Ventures (WEV, Santa Barbara), Kiva.org, Africare, Baal Dan Charities, UNICEF, J/P Haitian Relief Organization, International Justice Mission, Humane Farming Association, among others. Want to know more about our advisory practice? One of the many advantages of working with a boutique Registered Investment Advisory ("RIA") firm like Montecito Capital Management is we are 'hands-on' and this enables us to take our advisory services beyond investment decisions with counsel that encompasses all aspects of a client's personal financial profile. We start with a discussion about personal, business and family considerations within the framework of financial goals, then we determine how best to maximize your success, on your terms. We tailor our services to each client's unique circumstances, such as complexity of assets, income, work stability, age, health, life goals, charitable intent & family dynamics. Unlike large turnkey advisory companies associated with banks or brokerages, you do not have to go through a Committee for approval to make investment changes to meet your desired objectives, nor do you receive a 'cooker cutter' one-fit-all approach. Rather, we customize our strategic plan to meet your goals, which in turn help you better achieve the optimal investment portfolio outcome. Our passion for excellence means we won't rest until we've done all we can to solve your financial matters, with a strong commitment to responsive and cost-effective client services. Serving clients as an "Independent" RIA translates into greater flexibility of choices for competitive options available in the marketplace, along with a significant higher level of personal service. For example, we don't take shortcuts with time spent with clients and we believe advising is a highly communicative process and it is essential that clients understand the process: why we are recommending certain actions and what specifically are we trying to accomplish with our strategies? Why we are honored to be rated as an elite "Five Star Advisor" by Paladin Registry since 2004? The Registry's founder (Jack Waymire) is an industry oversight leader and an acclaimed author, including Who’s Watching Your Money?, Five Steps for Selecting the Best Financial Advisor and 17 Paladin Principles for Selecting a Financial Advisor. His books and research have identified problems and solutions in the two major markets for advisory services: 1) baby boomers who suffered severe losses in their retirement accounts during recent bear markets and 2) current retirees. Both groups have been flocking to advisors because they believe the professionals’ expertise will help them win back losses, preserve retirement assets, and produce better results in the future. What they don’t know, based on Paladin research, is that at least 75% of advisors are sales representatives who use expertise as a sales tactic to win investor assets. Waymire said, “That’s why millions of investors change advisors every year. At some point they realize they didn’t hire a real expert for their assets. This usually occurs after their results don’t match the excessive expectations that they were sold.” This is why Waymire created Paladin Registry as a neutral, third-party advisor evaluation service to help investors evaluate and select qualified financial advisors. Our independence means clients have the freedom to choose the best-of-breed solutions from a host of different superior services and investments, many of which render cost savings. Our goal is a long-term partnership that is a fixed fee-based relationship, generating no conflict of interest such as hidden fees, commissions, fund loads or account churns. This sets us apart from large bank wealth management services and brokerages, where there are often inherent conflicts of interest with proprietary funds and products being recommended to clients. Our firm's offices are conveniently located to serve most major Central & Southern California markets: San Luis Obispo County, Santa Barbara County, Ventura County, Los Angeles County, San Bernardino County and Orange County. transparency, accountability and asset safeguards is all to better serve our clients. Our clients also have 24/7 online access to their Charles Schwab "discount brokerage" account(s) ($4.95 stock/ETF trades) and receive statements directly from a trusted third-party, Charles Schwab. Another Schwab advantage is we have the benefit of thousands of investments with no transaction fees through their OneSource® program. Click here to discover the Registered Investment Advisor difference with Charles Schwab. To best serve at the convenience of our clients, advisors also regularly travel within 120 mile radius of both the Central & Southern California offices to meet clients at their homes, businesses or for lunch advisory meetings at privacy-appropriate restaurants. Prospective clients outside our region are also welcome to contact our firm. Disclaimer: The website provides general information regarding our business along with access to additional investment related information. Material presented on this website is believed to be from reliable sources and is meant for informational purposes only. The intent is to provide helpful information, which should NOT be construed as investment advice. We do not guarantee its accuracy, nor completeness, and it is not intended to be the primary basis for investment decisions. We do not make personal investment recommendations to people or entities except to those who have engaged us expressly for the purpose of providing professional investment advisory services. Investing involves risk and possible loss of principal capital. Montecito Capital Management Group’s ADV filing is available online at http://www.adviserinfo.sec.gov and current FORM ADV Part 2, which describes the services offered, fees charged and detailed company information, among other things, is available upon request free of charge. To a certain degree we are limited in our fiduciary capacity by the firm's non-discretionary client relationship, whereby the client dictates the investment parameters and contractually agrees to accept sole responsibility for their choices.